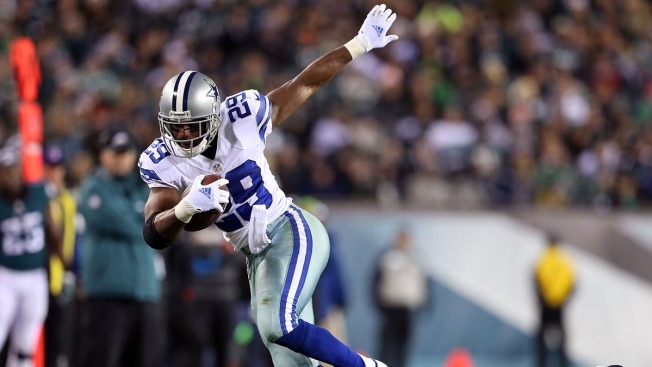 For a championship, of course I want to see DeMarco Murray play Sunday against the Colts despite a broken hand. But out of curiosity, it would be intriguing if he didn’t. Murray’s having an MVP season for the Cowboys. On pace to lead the NFL in rushing, break Emmitt Smith’s franchise rushing record and have the most touches by a running back since James Wilder of the Bucs way back in 1982. But, as I’ve said before, I still think he leaves plenty of yards on the field with poor vision and incorrect cuts. Through 14 games he has 80 percent of the team’s carries. If he can’t play Sunday, what would Dallas’ running game look like? Obviously it would be a committee, with carries distributed between Lance Dunbar, Joseph Randle and maybe even Ryan Williams called up from the practice squad. Thanks to Murray’s history of injuries, this isn’t a complete shock to the system. When he missed two games last year Randle stepped in with 91 yards on 33 carries. Dunbar has also shown explosiveness in the run game and on screen passes. Look, the Cowboys have a better chance to beat the Colts with Murray toting the football 25 times. I’m just saying I don’t think it becomes hopeless if he doesn’t play. Garrett: Zack Martin Was "Just Fantastic"
The offensive line is better than its given credit for, and I think that will be evident if Murray can’t play against the Colts.